A slew of bomb attacks killed about 50 people in the Iraqi capital and a village in the north of the country on Wednesday, according to hospital and police sources cited by Reuters. In the deadliest incident, a bomb blew up mourners at a funeral for a pro-government Sunni Muslim militiamen who died two days ago, police said. It killed 18 people and wounded 16 in Shatub, a village south of Baquba, Reuters reported. Two years after U.S. troops withdrew from Iraq, violence has reached levels seen in 2006 and 2007, when tens of thousands of people died. BAGHDAD — Seven bomb explosions killed 26 people and wounded 67 in the Iraqi capital on Monday, police and medics said, as security forces battled Sunni Muslim militants around the western cities of Falluja and Ramadi. Al Qaeda militants and their local allies seized control of Falluja and parts of Ramadi on January 1, exploiting resentment among minority Sunnis against the government for policies perceived as unfairly penalizing their once-dominant community. Iraqis are fleeing fighting in the cities of Fallujah and Ramadi at rates not seen since that country’s civil war six years ago. Iraq has just been through its worst 12 months of violence in years, reaching levels not seen since it was emerging from its most turbulent post-invasion period between 2006 and 2008. 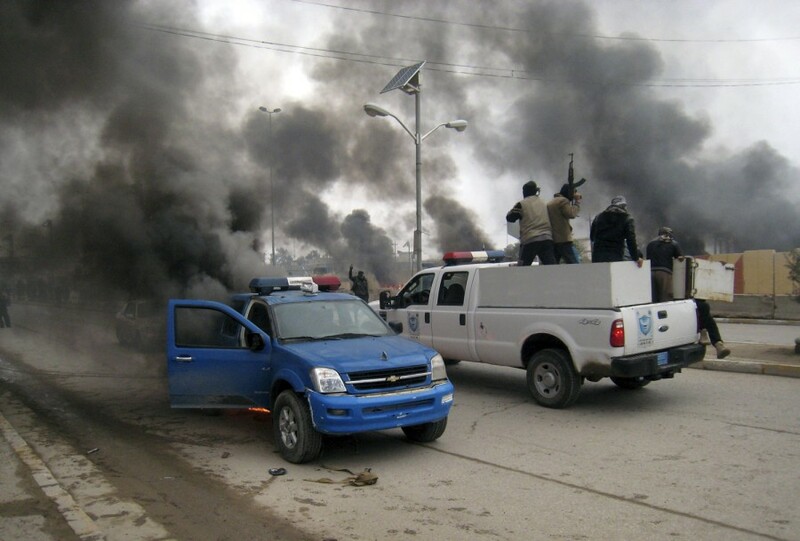 In recent weeks, fighters opposed to the government have taken control of parts of the cities of Ramadi and Fallujah. On Sunday, government forces launched an all-out offensive to push back the fighters in Ramadi, officials said. On Monday, seven bombs hit the capital Baghdad, killing at least 26 people and wounding 67, officials told Reuters. At least 49 people were killed as bombs rocked predominantly Shi’ite Muslim districts of the Iraqi capital and the southern city of Hilla on Tuesday, police and hospital sources said. The deadliest violence hit Hilla a small city around 60 miles south of Baghdad, where seven car bombs killed 35 people inside the city itself and in the nearby towns of Haswa, Mahaweel and Mussayab. “Hilla hospital has received 35 bodies so far from seven car bomb blasts,” said one health official. A further 90 people were wounded in the blasts. Fourteen more people were killed in explosions in mainly Shi’ite districts of Baghdad. 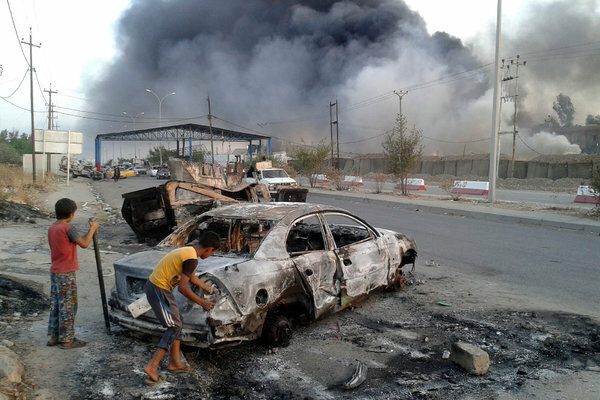 Last year was Iraq’s bloodiest since sectarian bloodshed began to abate in 2008. BAGHDAD (AP) — A series of car bombs hit commercial areas and marketplaces in mainly Shiite areas of Baghdad on Wednesday, killing at least 17 people, officials said. The bombings were the latest in a campaign by Sunni militants seeking to undermine the Shiite-led government’s efforts to maintain security across the country less than two months ahead of national elections. Violence has surged in Iraq since last year, with the country weathering its deadliest bout of violence since it pulled back from the brink of civil war in 2008. U.N. figures showed that last year, the country saw the highest death toll in attacks, with 8,868 people killed. On April 30, Iraq is to hold its first parliamentary elections since the U.S. troops’ withdrawal in late 2011. Wednesday’s attacks were all carried out by explosives-rigged cars parked in streets of the capital’s mainly Shiite areas. Two of the bombings rocked outdoor markets in the northern neighborhoods of Shaab and Shula, killing four civilians in each attack, police said. At least 31 others were wounded in these blasts. Such bombings have increased, along with Sunni anger over perceived mistreatment and random arrests of Sunnis by the authorities. People gather at the site of a car bomb attack in Baghdad, June 8, 2014. BAGHDAD (AP) — A series of car bombs exploded across Iraq’s capital Saturday night, killing at least 52 people in a day of violence that saw militants storm a university in the country’s restive Anbar province and take dozens hostage, authorities said. The day began with militants killing three police officers on guard at the gates of Anbar University, a police and a military official said. Islamic extremists and other anti-government militias have held parts of Anbar’s nearby provincial capital of Ramadi and the city of Fallujah since December amid rising tensions between Sunni Muslims and the Shiite-led government in Baghdad. Meanwhile in the northern city of Mosul, clashes continued Saturday for a second day between security forces and Sunni militants trying to seize neighborhoods there. Police and morgue officials said that fighting since dawn Saturday killed 21 police officers and 38 militants. Al-Qaida-linked fighters and their allies seized Fallujah and parts of Ramadi in late December after authorities dismantled a protest camp of Sunnis angry at what they consider their second-class treatment by the Shiite-led government. Fearful of setting off violence, security forces withdrew from the area, allowing militants to seize the cities. In April 2013, a similar dismantling of a Sunni protest camp in Hawija sparked violent clashes and set off the current upsurge in killing. The government and its tribal allies are besieging the rebel-held areas, with fighting reported daily. 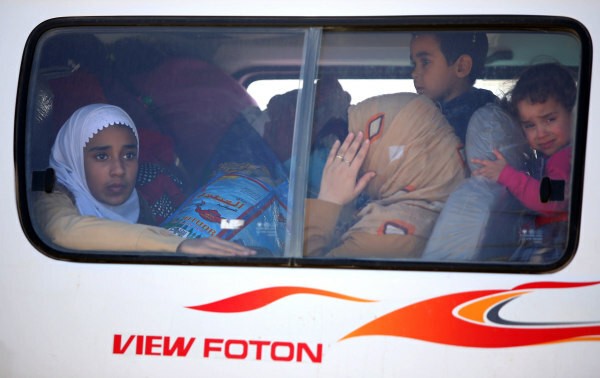 Tens of thousands have fled the violence. Fighters with the Islamic State of Iraq and Syria (ISIS), an al-Qaeda offshoot, overran the western bank of the city overnight after U.S.-trained Iraqi soldiers and police officers abandoned their posts, in some instances discarding their uniforms as they sought to escape the advance of the militants. Tens of thousands of Iraqi civilians also fled the surprise onslaught, which exposed the inadequacies of Iraq’s security forces, risked aggravating the country’s already fraught sectarian divide and enabled the extremists to capture large quantities of weaponry, much of it American.